Soil and frogs poured into their hands! Imagine the excitement. From potting plants to frogs in a split second, our unit study theme changed in an instant! In my K-1 class we had been planting seeds to watch them grow to maturity and pick their fruits. The children loved planting, watering, measuring and recording the results in their science journals. We were about to start growing some new plants. The children had decided on planting cherry tomatoes but I didn't have enough potting soil at school so I brought in an opened bag from home. 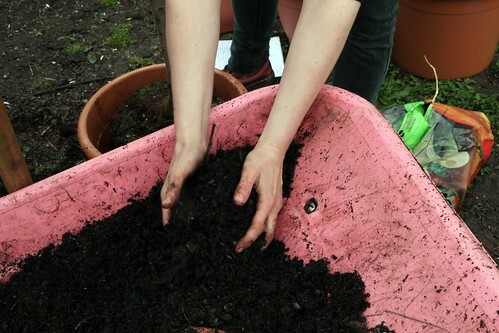 All of the children were looking forward to planting tomato seeds so we went out back to fill our flower pots with soil. I picked up the bag of potting soil and began to pour it into the sensory table. Suddenly one of the children spied something hopping. She squealed with delight. A frog was hopping out of the soil! Then another one. A third one! Soon there were too many to count. We found dozens of tiny toads in the potting soil! The day we tipped the toads into the sensory table began our obsession with learning about toads, frogs and other amphibians. The kids still wanted the tomatoes to grow but they were even more interested in finding out about the toads that arrived in the bag of soil. Do toads and frogs come from soil? Do they grow like plants? How did the toads get into the bag? Thus began our unit study about frogs and toads. We created a space in the sensory table for the toads to live, very carefully making sure that all the toads were in the tub and not buried by the soil. We then carefully placed the plexiglass cover over the tub so that the toads couldn't escape and moved the table into the classroom so that it wouldn't overheat. Our unit study evolved into an entire year of learning. We discovered that frogs and toads have different needs depending on the time of year and the weather. We learned about what they eat and where they live. While learning about these fascinating amphibians, the children learned to read and write. They learned mathematical concepts as well as history and science. The classroom looked like a frog pond because of our focus on frogs and toads. Rather than the usual textbooks and desks, the children were learning through hands-on activities. Reading and writing were the means for researching and sharing that research. Math was the means for gathering and recording data. 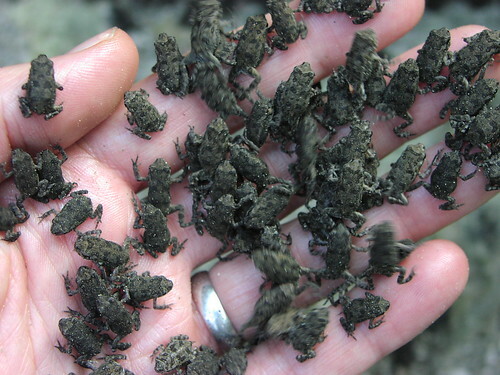 Have you ever held a tiny toad in your hand? How to hold a Tiny Toad! 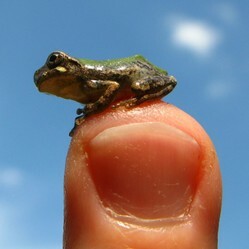 Have you ever held a tiny toad? None of my students had. Their small fingers itched to hold them but I feared that they might accidentally squish them without instruction so once the cover was on the sensory table I had all the children sit down so that we could talk about what had just happened. We talked about how toads come from eggs and not from seeds in the ground. We talked about how toads would not be found in a bag of soil but rather that since I had stored the open bag of soil in my backyard, the toads had moved in when they discovered what a great shelter it was. Then we began to talk about how to hold a tiny toad. We talked about how toads are fragile. Holding a toad too tightly could harm it. I passed around a cotton ball so that the children could experiment with a delicate touch. Then we tried to toss the cotton ball and catch it to imitate catching a jumping toad. Once I felt that the children were able to hold the cotton ball safely, we talked about the toad's skin. Amphibians breath through their skin so it is very important that our hands be clean before touching the toads. The children washed their hands and thoroughly rinsed them and sat back down in the circle. Finally I took out one tiny toad and showed the children how to hold it and gently pass it from one to another. What a thrill! That was the first day of the beginning of our unit study on Frogs and Toads. It actually continued on for the rest of the year. I included activities that I had done when homeschooling my children as well as activities that I had discovered elsewhere over the years. As you visit my other articles about frogs, toads, and salamanders you will be sure to discover dozens of fun activities you and your children will enjoy. When we poured out the potting soil tiny frogs poured out with it! Learn to add, subtract, multiply and divide with frogs. We spent quite a while observing the toads, talking about them, watching they way they hopped etc. In the end, we let them go to live out their lives in the wild where all animals belong. I find little ones like that in my New Hampshire yard. So cute and you made excellent use of that learning opportunity. I lived in San Antonio for many years and kept potting soil in a bag on my balcony. One day I reached in to get some soil out and the soil was full of fire ants! That sure hurt! But pouring rubbing alcohol on the bites took the sting away. I've never seen such tiny frogs as yours, but have seen frogs living in some water in a ditch. It sure was CherylsArt, Dozens of tiny frogs or toads hopping out of the bag of potting soil into the sensory table. I do imagine it was the experience of a lifetime. Thank you, Katiem2, for stopping by to read the story. The law of life - My view about life and what we can do to help others around us.